How to watch 2018 World Cup Final without cable subscription for Free! The FIFA World Cup 2018 has just two games remaining, the World Cup Final where France play Croatia and Belgium vs England in the third place play off. Whether you’re in the US, UK, Spain, France, Canada, Australia, Germany, or elsewhere, you can live stream the World Cup without a cable subscription for free online. Unless you’ve somehow lined up tickets to see your country play in Russia, there’s a good chance you’re going to be like almost everyone else and be forced to watch the games at home (or your local pub). In many countries, a cable subscription has long been the go-to choice, but with the growing cord-cutting trend, cable is quickly getting replaced by a handful of online-only streaming options. While some of those options are direct-to-consumer TV networks providing consumers access to streams for a fee, others options include lower-cost internet TV skinny bundles, and even streaming services that are completely free of charge to anyone with a computer and internet connection. Let’s explore some of the best options available to get in on the 2018 FIFA World Cup action without the high cost of cable. While you may end up in a situation where you need to pay in order to get all of the games you want to watch, there are several options that you can avail yourself of that are, yes, completely free to you. That said, there’s a good chance you’re going to need a VPN in order to access the high-quality and legal free streams, especially if you’re in the US or Canada, or traveling abroad while the World Cup is happening. Many streams are geographically locked, so you can’t access them unless you bypass those content restrictions. Our suggestion for VPN services boils down to ExpressVPN. Among the many services we’ve tested (and we have indeed tested quite a few of them), we’ve found that ExpressVPN offers the right balance between speed, security, and server options. BEST VPN FOR WATCHING THE WORLD CUP WITHOUT CABLE:ExpressVPN is our #1 Choice. With a vast server network that is optimized for high-speed connections, it’s perfect for watching the World Cup. User-friendly apps for all operating systems. Hard to beat on privacy and security. There is a 30-day money-back guarantee so you can try it risk-free. Both the BBC and ITV services heavily block most VPNs, so a quality VPN will be necessary if you’re connecting from abroad. That said, if you are using either the iPlayer or ITV, you’re required to have a TV License. And sorry, international folks: You can only buy a TV License if you’re a British resident. Even though the BBC iPlayer and ITV Hub streams can still be accessed without a TV License, we don’t recommend it as this kind of access is strictly frowned upon. The BBC iPlayer and ITV are going to provide some of the best streaming quality, but if you’re blocked from either due to a lack of a TV License, you still have a good number of options. If you only want commentary in English, your best option is SBS via The World Game. In order to use the service, you’ll need to connect to an Australian server via VPN if you’re outside of that country. 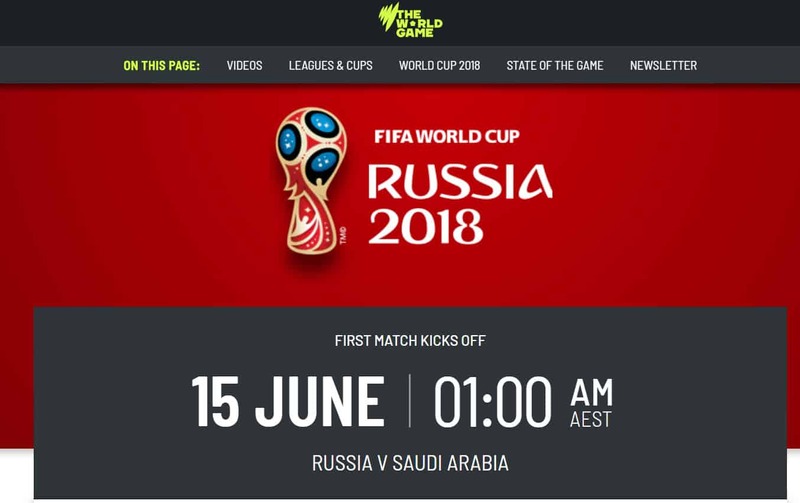 SBS will offer 25 matches, although fewer than 20 will be streamed live through The World Game SBS website. We recommend checking out our longer World Cup 2018 guide for more details and a longer list of free streams. If you’re a bit overwhelmed with VPNs and region hopping, you might benefit from a paid service. US and Canadian sports fans, in particular, will find the most value in this option. In the US, you have several great choices available to watch official streams of the Russia 2018 World Cup without cable, so long as you’re willing to pay a monthly subscription fee. There are now a growing number of internet TV « skinny bundle » services that sell the consumers the rights to view a selection of TV networks traditionally only found through a pricey cable package. The most well-known of these is Sling TV, but there are others you may want to consider. For these services, you’re specifically looking for any that have carry Fox Sports as part of the subscription. Fox Sports is the only US TV network that is currently carrying the rights to broadcast the FIFA World Cup in 2018. Prices will vary, and which subscription package carries Fox Sports on each service will also be different across the available options. If you’re a Canadian resident, your best choices are either Alt TV or Fibe TV. Modeled after the US skinny bundle services, Alt TV and Fibe TV are cord-cutter options available from Bell Canada. Considering CTV is carrying the World Cup matches, your cheapest route is to use the Alt TV « Starter » package, at CAD$14.95/month. If you want TSN, however, the Starter+Favorites 10 package is only CAD$24.95/month. The Fibe TV option is more expensive, but Bell Canada sells a « Good » package that includes both TSN and CTV for CAD$34.95/month. Regardless of which option you use, you can get the first month heavily discounted, and the service will be charged on a month-to-month basis. You can easily cancel anytime (such as right after the World Cup ends).